When motorway and other road projects are being drafted councils around Ireland often include an artwork or two. Sometimes this is done by a local artist. In this case, the artist is unknown and the artwork is a strange, off-beat form of street art. The above pictured artwork was installed along what used to be a straight ramp into a direct underpass parallel to where the N81 crosses the M50 ring road in Dublin — linking the suburb of Tallaght to Dublin City. The commissioning of this item of art was linked to the construction of a slip road off the N81 into the M50 northbound, a project which took away space from the two-way underpass walking and cycling route. A source who is familiar with the dark arts of Irish cycle lane design explains: “Access onto the cycle underpass involves a sharp 90 degree turn, and then three much sharper turns – almost impossible to negotiate without coming to a near-stop and putting a foot on the ground.” Forcing cyclists to make contact with the ground makes it “interactive art”. I’m sure the gradient is now much more forgiving as a result of the longer route so its not all bad, unfortunately they haven’t considered how difficult it is to do several 90 degree turns whilst going downhill on a bike. The dutch (given the same space restrictions) would have made the path much wider, the curves less sharp, and would have clear separation of the pedestrian and cycle sides with a small dropped kerb and different surface treatment. The entire route would also be adequately lit, rather than just the indirect lighting from the streetlamps. 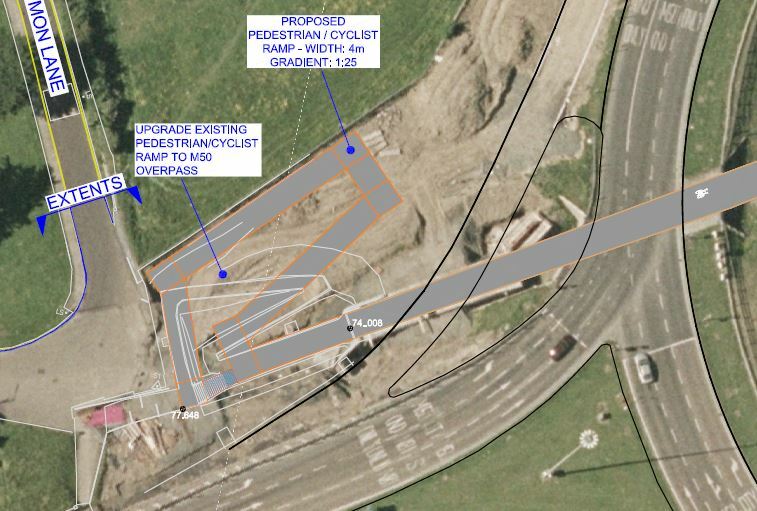 Of course, the planning of the surrounding roads would have intricately involved the cycle facilities from the start, so there could be a straight path AND a forgiving gradient all the way into the underpass, but irish planners are not dutch planners, and wont be comparable for a long time.